Fatoumata is 19 and of Malinke descent. She lost her father very young and her mother remarried and lives in a village. 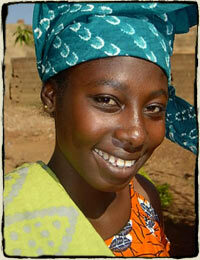 Fatoumata lives with her older sister who is married and also begs. She has three brothers who are trained as stone masons however all are unemployed. They all live together in a poor neighborhood and live off the meager earnings from begging. As a young girl, Fatoumata was raped and gave birth to a stillborn infant. Before she came to the center, she was a maid in a family's home but was so abused by the entire family that she ran away. To keep body and soul together she turned to begging like the rest of the family. She entered into the system of renting babies from other women but it hardly fed her and many days she would go without food. She always thought she would be dependent on others and resigned herself to a life of begging. She never dreamed she would someday have her own skill and a business. Fatoumata has emerged as a very strong leader. She is exceptionally articulate despite the fact that she has never been to school and like the others cannot read or write. She will lead one of the teams in starting their own business.